Running the Tangents in a marathon can shave minutes off your time. Most people assume the marathon is exactly 26.2 miles. This is true, but only if you run the shortest legal route possible and even then you will run a little extra. Each course is measured on its shortest possible route, called the route line. When the course is measured and laid out a small amount of padding is built in to ensure the course complies. Follow this link to see the USTAF guidelines. With the advent of GPS tracking may runners found they were running much more than 26.2 miles. Some people were seeing an additional half or mile or further. At first the inaccuracy of GPS was given the blame. Then some were blaming the people who measured the course. There is a small amount of padding added when measuring the course, but this is usually around 150 yards. The problem is many runners including elites runners do not run the the shortest distance possible. The goal is to run as close to the tangents as possible. So what is a tangent? It is the shortest line possible to run between two given points. The only time you ever want to be off the route line is to get water, avoid traffic, run in the shade on a hot day, or run on a surface that is superior to the tangent line. However, most people aren’t aware of the route line and end up running much further. These runners can add enough extra distance to affect their time adversely. By running a marathon course correctly, it is possible to knock anywhere from 3 to 5 minutes or more off your time compared to a runner who stays on the center line. Let’s take the New York City marathon, for example. Once runners enter Central Park, there are 46 turns. People not running the tangents, can be add around two to three seconds per turn. For just this portion of the race, one can add as much 2-3 minutes depend on your pace! Many runners tend to stay on or near the center-line for the entire race. Even when there is a 90-degree turn where the inside curb was 30 feet away, they still tend stay on or near the center line. 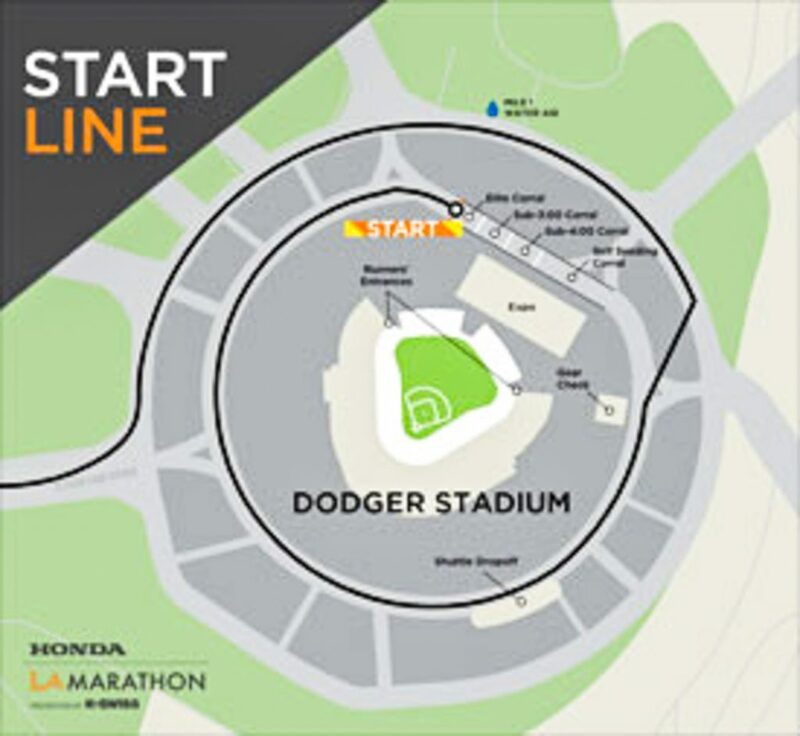 After the L.A. race, there were complaints on the bulletin boards stating the course was too long. Instead of the 26.2 miles, some runners had readings of 26:50-27 miles. This meant these runners ran an extra 1/3 of a mile because they did not run the tangents. On average, a bulk of the runners will run an extra 0.3-0.5 miles over the course of a normal marathon. This means a runner who averages 10 minutes/mile will run an extra three minutes and 30 seconds to an extra five minutes because of the extra distance. You do not want to be one of those runners who needlessly adds five minutes to your time. Be proactive! Once the race is underway and the crowd thins out, pay attention to what is ahead. If the course is in the city and there are only right and left turns, as you come out of a turn, determine which way the next turn is. If the turn is on the same side of the street, then do not stray to far from the curb. If the turn is on the opposite side, then mentally draw a straight line diagonally to the next corner. Be aware this may mean you have to cut in front or behind other runners! This is OK as long as you do not force anyone to break stride. Another positive byproduct is it helps to keep you focused and engaged. The width of the road was about 80-100 feet wide. Many people ran an average 60 feet from the inside line for the entire mile. This adds an extra 376 feet just in the first mile. For a person running a ten minute mile, this would add an extra 42 seconds. 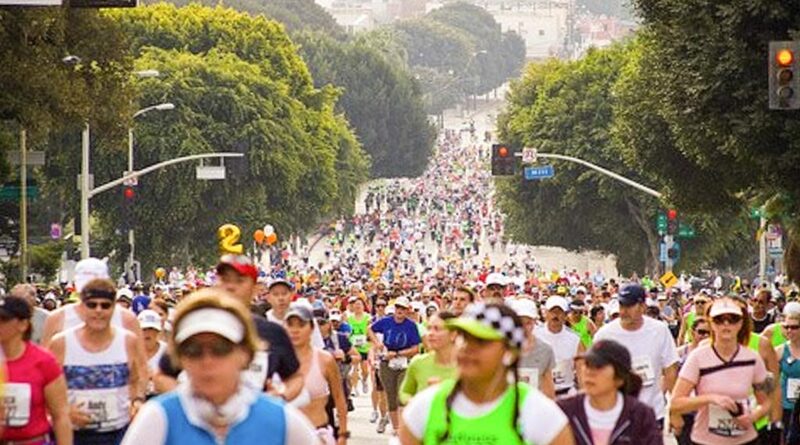 This picture shows runners going up Temple Street in the L.A. marathon. At the bottom of the hill, the runners made a right turn onto Temple. At the top of the hill, the runners made another right turn. This street is about 80 feet wide. This means the people on the right of this picture ran an extra 160 feet just in these few short blocks. If they were running 10 minute mile pace, they added just 18 seconds to their time. In this case the ideal line is to stay as close to the right curb as possible. With the above examples, it is easy to see how one could lose ten to twenty seconds here and there. Over the course of the marathon these seconds soon add up to minutes. So remember, the goal is to take the same line that the course is measured on. Plot your heading after coming out of each corner. Aim for the apex of the next curve.